I think we're all familiar with the game of Life. Eva played for the first time the other night and she loved it. Eva's only 4, so we didn't get into all the nitty, gritty details that make the game last for days. She loved picking out the people and stuffing them in the cars and driving over the hills and past the church. She loved payday. She hated the car wreck that took all her money and threw one of her girls out the back window. Here's something that I think will surprise you: Milton Bradley produced the game in 1860 as "The Checkered Game of Life." Abraham Lincoln could have played the same game I just played last night. Isn't that freaky? When SC seceded from the Union? Someone could have been playing Life. In the original game, a player could score extra points by reaching "Happy Old Age." That's been phased out of the newer versions. 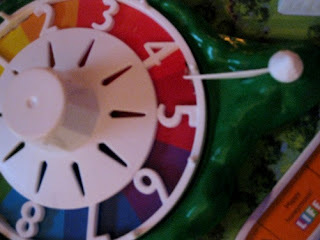 As indicated by the title, the game simulates real life as 1-6 players progress across the board by the spin of a dial. 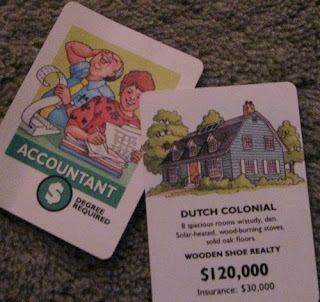 Eva went to college and became an Accountant and later purchased a lovely Dutch Colonial. I ended up with a beach house and Patti, poor thing, purchased a Split Level right on a fault line that made the house literally split. Cost her a fortune, but it was fun to hear Eva say, "Awww, mama got a crappy house." Not sure I've ever heard Eva say "crappy" before. Ironically, I wrote a Great American Novel. Patti won a Humanitarian Award and Eva invented a new flavor of ice-cream. I started to think this game had ouija game powers or something - how'd it nail us like that? But then I climbed Mt. Everest. Like that would ever happen. Stupid game. When I was young, the game ended when all players reached the Day of Reckoning which always scared me, it sounded too much like The Rapture or The Judgement Seat. At the Day of Reckoning mom and dad would gather all our crap and after five hours of bookkeeping and calculating, 3 cups of coffee and usually two arguments, they would declare a winner and hide the game in a really good spot so we wouldn't find it for another five years. On the Day of Reckoning, each player would be placed at "Millionaire's Acre" or "The Poor Farm." Just like they did away with "Happy Old Age," they did away with "The Poor Farm" in later versions and now you can either retire at "Millionaire Estates" or "Countryside Acres." ... and somewhere along the way "Share the Wealth" cards were added. I think it was around the time Obama was elected. In the interest of full disclosure: If you click the game below and purchase it, I get a t-tiny bit of money, something like 2 or 3 cents, not enough to get me to Millionaire Acres, but maybe, eventually, enough to keep me out of "The Poor Farm." 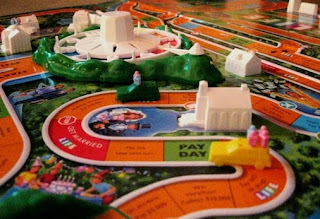 I wish the game of life,WAS a little more like this!! Haven't you anything better to do than play games?